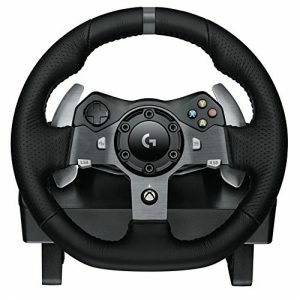 This, of course, is the Logitech G920 racing wheel. The biggest difference between the G29 and the G920 is that the G29 is designed for either PC or PlayStation and the G920 is designed for either PC or Xbox One. So for PC users it really comes down to the arrangement of the buttons and price. You will typically pay a little more for the G920, but if you like the buttons better it might be worth it. The Amazon listing says this is for the Xbox One, but it’s also for the PC. Likewise, the listing says “Wheel Only” but this set includes the wheel and pedals. It does not include the H-pattern shifter which you can get separately. If you do want the shifter, you can save a couple of bucks and buy the wheel and shifter bundle here.